« Preventing Colds in Seniors – Should they and their caregivers get flu shots? We’ve all heard how a Mediterranean diet high in good oils such as olive oil, as well as vegetables is good for your health, regardless of your age. But now we’re learning just how good it really is. 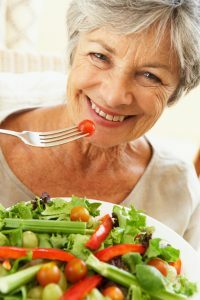 In a study published in JAMA Internal Medicine and reported in Time magazine, Dr. Emilio Ros from the Hospital Clinic in Barcelona, Spain and his colleagues conducted a study of 447 men and women aged 55 to 80 years to see whether changing their diet could affect their performance on cognitive tests. The volunteers were healthy but at higher risk of developing heart-related problems; some smoked or had hypertension, for instance, others had a family history of heart issues. Everyone in the study was randomly assigned to eat, for about four years, a Mediterranean diet supplemented with 1 liter of extra virgin olive oil a week, a Mediterranean diet enhanced with 30 grams of nuts a day, or a low-fat diet. The researchers performed a series of brain functioning tests on the participants at the start of the study and then at the end of the study. Researchers stress that research in this area is important due to the expected extensive population aging over the next 20-30 years. They envision that the utilization of a dietary pattern, such as the Mediterranean diet, will be an essential tool to maintain quality of life and reduce the potential social and economic burdens of manifested cognitive declines like dementia. This entry was posted in Tips and tagged mediterranean diet. Bookmark the permalink. Both comments and trackbacks are currently closed.